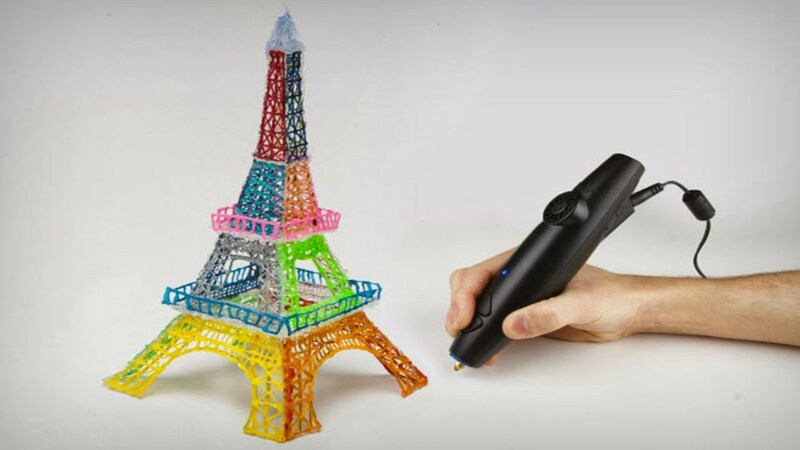 Home › Teaching & Learning › 3D pens? Who’d a thunk it? Is there really such a thing as a 3D pen? Can you really write in the air? It all sounds very science-fictional. But 40 years ago 3D printers seemed science-fictional, and yet they were invented soon thereafter — back in 1981 (though they didn’t become available at a suitable price point for home users until decades later). As far as I can tell, the distinction between a 3D printer and a 3D pen is the same as the distinction between a 2D printer and a 2D pen: the printer requires a computer file, but the pen lets you draw freehand. Or, should I say, it requires you to draw freehand. And there’s the rub. I can imagine both educational and hobby uses for both 3D technologies, but I’m definitely not an artist. Could I really produce anything respectable looking in 3D if I had to draw it myself? I know I could never produce something like the Eiffel Tower in the image above — it’s not even worth dreaming about.